Yes, I served bratwurst with Roshambo 2004 Imago Chardonnay. Not an elegant match to say the least, what can I say? I’m not always going for the perfect pair! The wine came in a club shipment, cost us $15.20, had a real cork closure, and clocked in at 13.9% alcohol by volume. On the nose I found lemon, minerals, wet stone, and pineapple. The nose was crisp and clean. In the mouth, lemons, pineapples, sweet orange. Overall the wine was crisp in the mouth with a nice finish. In typically me style in my tasting notes, I wrote “me likey” as my final note What can I say? Eloquent I am not always. I swear we eat things other than crab legs and pizza. I know you can’t tell that right now, but I am really just behind in getting up posts. A virus infected my work computer so I have had no internet access during the day as I am sans computer at the moment and just haven’t been able to catch up on getting posts up! We drank this 2005 Marry Me Roussanne by Roshambo with a dinner of snow crab leg clusters with fresh lemon and butter. (I will admit, this is one our favorite summertime dinners!) The wine came in a club shipment, had a real cork closure, weighed in at 14.1% alcohol by volume, and cost us $12.00. On the nose I found lemon, honeysuckle, something tropical, pear, and white flowers. The nose was very aromatic. In the mouth the wine tastes a bit like a slightly heavy unoaked chardonnay, though it was a bit tart. Flavors displayed in the mouth were pear, honey, and apricots. I thought this was a good effort from Roshambo and for the price point was a very good value. I also like trying new varietals, so that made my day as well. The wine was a 2004 Roshambo Taylor Vineyard Zinfandel. It cost $28 in a club shipment, was 15.4% alcohol by volume and had a real cork closure. I served it with cheeseburgers and corn on the cob in a celebration of grilling weather returning (though we will have to wait until we move to the house to actually grill, you can’t have grills on balconies in the county we live in). Normally I would pick a Cabernet Sauvignon with my burger, but we don’t have any that I feel are ready to drink right now. On the nose of the wine I found blackberry jam, hints of vanilla, tart cherries and spices. In the mouth the tart cherries on the nose followed through and raspberries showed up in the glass over the course of the evening, along with nice spices that went well with the tart cherries. The finish was long and smooth. I drank this one in my first blog tasting back in November and said I should cellar it longer. I think it’s drinking really well right now, the flavors are great; it’s easily my favorite Roshambo offering so far. It’s also interesting to see just what drinking wine nearly every night for 6 months has done to my palate. Picking out flavors seems much easier and it’s difficult for me to decide if that’s because I have more confidence now or if perhaps I was right and this wine did need to sit for a bit longer (can 6 months make that much of a difference?). Back in my first post on this wine, I said it tasted fruited and that I thought perhaps it was cherries. I also picked up on the spice, but thought it was pepper at the time. I was cautious in my review and was questioning myself. I still have ocassions where I question if I am actually tasting something that I think I am or times where I know there is a flavor in the wine but I simply can’t place it. However, I don’t find those times frustrating, I see them as a chance to figure out what it is and I often post them here to see if anyone else has had the wine and can help me put a finger on what I am tasting. Let’s see what the next 6 months of tasting does for me. If for nothing else, I hope my confidence in my palate continues to grow and that I get to taste many more great wines. I attempted to serve the 2004 Roshambo Syrah from the Frank Johnson Vineyard with our dinner. It didn’t work. The alcohol and heat on this wine when I poured it just wouldn’t go away. It took well over an hour sitting in our glasses before the alcohol scent disappeared and I could actually attempt to drink this. The wine was 15.5% alcohol by volume, had a cork closure and came in a wine club shipment, yet another one without a price list. Eventually on the nose I found raspberries and cloves, plus a bit of earth and oak. I was trying to serve this with pasta, fresh tomato sauce and fresh grated parmasean, but that didn’t work out, so we drank it by itself after (long after) dinner. Perhaps food would have helped this wine out, but to be honest, I’m not so sure. In the mouth there really weren’t any flavors. It was very muted and all I can say is that the wine was bitter, astringent and thin. It really didn’t do much for me. I can’t find this online, but I really hope we it didn’t cost too much. I’m a little behind in my wine reviews, which I suppose is fine because there won’t be any wine drinking tonight (I’m still recovering a bit from last night) so at least I have a few back-ups to post! 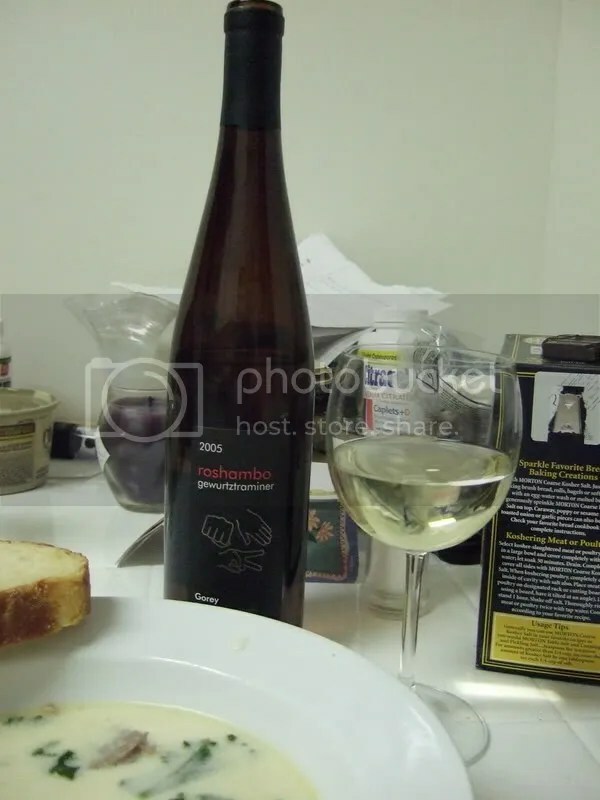 Anyway, on Monday we drank a bottle of 2005 Roshambo Gorey Gewurtztraminer. It had a real cork, cost us around $15 and is 14.1% alcohol by volume. I paired it with some more of the Zuppa Toscana because it struck me that it might be a good match with the spiciness of the sausage. It smells like Gewurtztraminer……it’s aromatic, floral, lightly sweet with an undertone of spice. Honeysuckle especially seemed to jump out. In the mouth, it’s a little greasy. Very heavy and palate coating and an odd kick of maybe petrol at the end? Also quite sweet. NMS. Just kidding, but Matt once thought it would be really cool to make a movie about giants destroying Los Angeles. Then we saw it was already made, only about Manhattan. Totally off point except for the fact that last night’s wine was a 2005 Roshambo “The Rat” Carignane. Cost us $17.78 in a club shipment, real cork closure and 14.4% alcohol by volume. On the nose and in the mouth, there was raspberry and pepper in this wine. It reminded me somewhat of a Syrah. The tannins were a little strong on the end, but mellowed considerably as the wine aired. I thought overall this was a really well done wine. In honor of their new venture, we broke open a bottle of 2005 ‘The Obvious” Sauvignon Blanc. Cork closure and was somewhere around $15. Crisp and clean flavors. Very citrusy and tart. That’s not a bad thing to me though. I love tarty wines. Some melon flavors too. Yum! Good mineral flavors and a lingering finish. An all around fun glass to drink. I imagine seafood and a summer day. 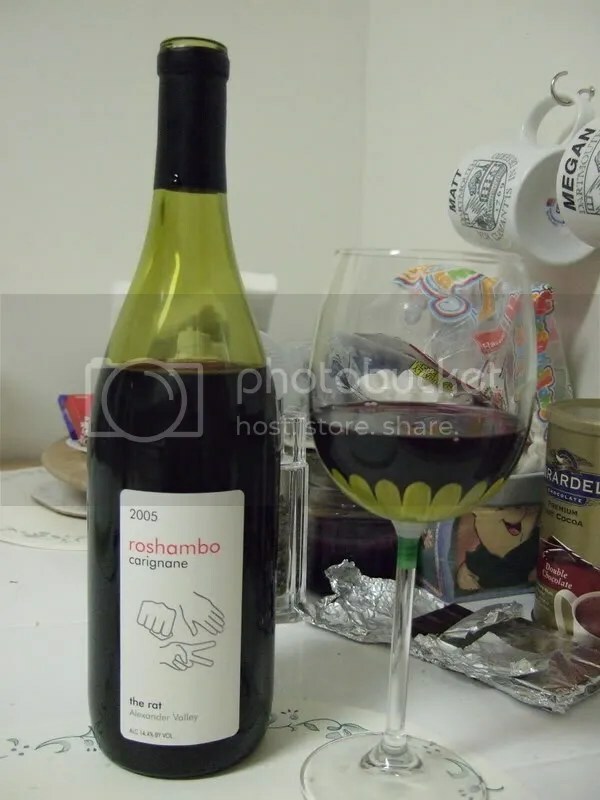 So raise a glass, and join me in wishing Roshambo the best of luck with their Roshambus!